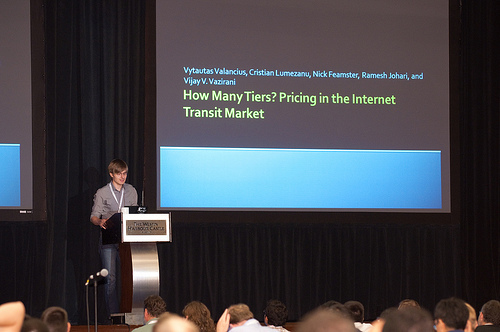 Valas Valancius presented a paper on tiered pricing strategies for the Internet transit market at SIGCOMM 2011. The paper used traffic demand data from three different ISPs to analyze how ISP profit varied when ISPs sell service according to different “tiers”, as opposed to having a single flat-rate pricing system for all traffic. The paper found that ISPs can capture near-optimal profits by differentiating pricing for Internet traffic into just a few tiers.